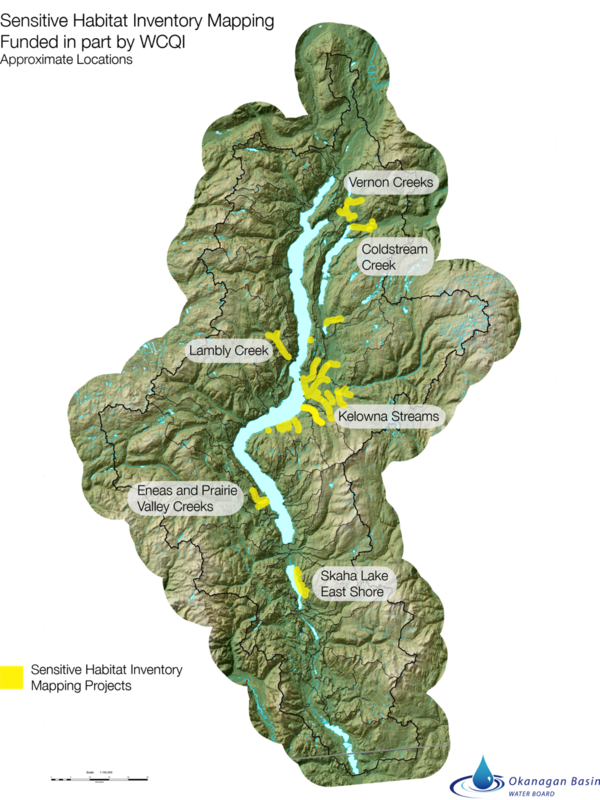 Sensitive Habitat Inventory Mapping (SHIM) is intended as a standard for fish and aquatic habitat mapping in urban and rural watersheds in residential, commercial, agricultural, industrial and recreational land use areas in British Columbia. This method ensures the collection and mapping of reliable, high quality, current and spatially accurate information about local freshwater habitats and watercourses. Streams and other freshwater watercourses are a critical component to the health, vitality and economies of the urban and rural landscapes of British Columbia. They not only contain the runoff for water downhill, but also provide critical habitats and corridors for fish and wildlife. In BC, small streams and watercourses provide critical spawning, rearing, overwintering and feeding habitats for both adult and juvenile salmonids. These environments are also home to many other species of fish, aquatic invertebrates, benthic organisms, wildlife and plants, all of which function as a part of the freshwater community and the entire ecosystem. Conditions in and adjacent to streams are easily disturbed, and changes in land use can adversely affect the overall health and state of the streams and watercourses and the plants and animals within them. Human disturbance to freshwater watercourses often results from housing, industry and road development, and leads to the decline and alteration of: surface water runoff; stream channel stability; watershed based nutrient cycles; other organic/ inorganic constituents; riparian vegetation; in-stream vegetation; water temperature and flow regimes. These forms of disturbance can cause dramatic changes in the ecosystem biodiversity, population status and the form and function of watersheds and ecosystems. Good land use planning and decision making requires accurate, precise and recent spatial habitat information. Accurately inventoried and delineated small urban streams, wetlands, watercourses, and riparian areas will help improve current land use planning processes and promote decisions made through greater understanding, improved planning practices, heightened protection and clearer priorities for fish and wildlife habitat restoration and enhancement. The SHIM methods are intended to provide community, stewardship groups, individuals, regional districts and municipalities with an effective low cost approach to map and inventory local watercourses. The principal objective of this method is to identify, inventory, and map all watercourses, their associated riparian habitats and important fisheries habitat features. These methods are also intended to inventory and map watercourses not currently identified or acknowledged in local/regional plans and maps. The Sensitive Habitat Inventory Mapping (SHIM) method is designed to provide the basis for accurately mapping baseline data that can be integrated into local mapping and planning initiatives. The mapping information collected is intended to augment and potentially enhance local land use planning maps and/or specific site or detailed planning surveys. The mapping methods and tools presented here include field surveying and mapping techniques that will allow information to be incorporated into geographical information systems (GIS) using global positioning systems (GPS) for field collection. The mapping information collected will include survey data on sensitive habitats, features and attributes, riparian areas, fish presence and watershed imperviousness. Assist in understanding urban water runoff patterns and help determine areas of impervious surfaces in urban watersheds. Mason, B., and R. Knight. 2001. Sensitive Habitat Inventory and Mapping. Community Mapping Network, Vancouver, British Columbia. 315pp + viii. M. Johannes, Editor.